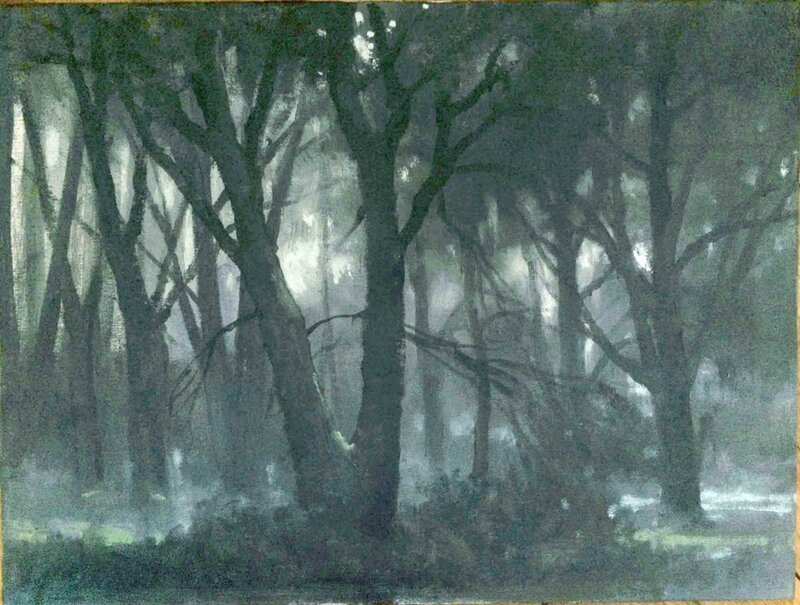 Spring green (oil) …….finished……sort of…….oh wait……………..
As ever there are a few paintings underway. Happy that this paining has gone to a new home, very close to where it was painted. Seems right. I hope the new owner will be happy with it. Never sure if it’s a good idea to go back to a painting . This one is a year old and I gave into temptation to change it a bit. Perhaps its time to stop with this one .The age old problem of whether a painting is complete or not doesn’t go away. Every picture reaches this stage and it doesn’t get any easier to decide. Keep it fresh or risk killing it with overworking it. There is always room for improvement or something that you find annoying but sometimes it’s better to leave well alone. Who knows ? Managed to get started with this little oil sketch of one of my favorite places in Transylvania. From a photo but fingers crossed I will be painting ‘en plein air ‘ in the summer. I do find it difficult to deal with so many pictures, what to do with them all ? I was pleased with my recent sale in that it meant not only someone liked it enough to buy it but equally that I had one less picture to find space for. of preparatory sketches to try to work out a process. Always nice to sell a painting.This one went today. I don't tend to use the more common WIP abbreviation as 'work in progress' is not always a good description, as 'progress' is not always made . Seem to have been working on this but it doesn't seem to have changed much,if at all ,since the last post. A bit like one of those 'spot the difference'competitions. Colour is a bit closer to the real colour though as I took the photo in better light. 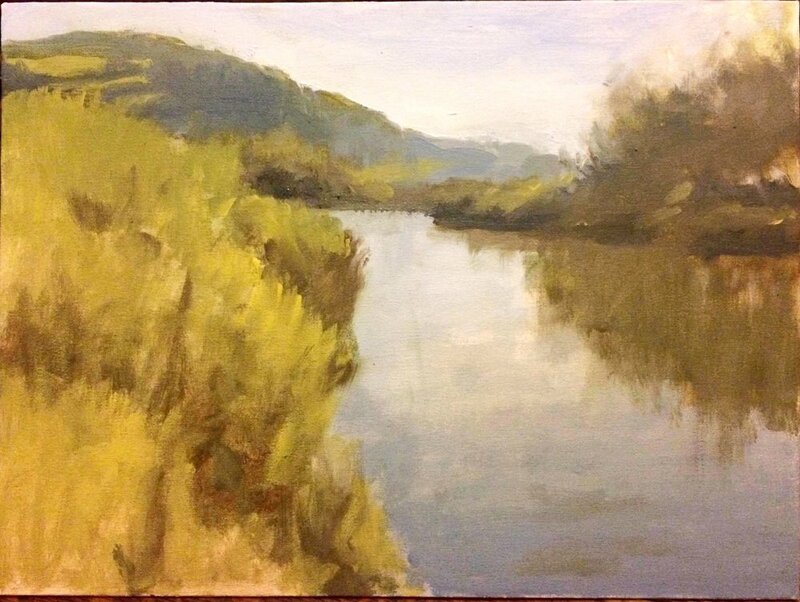 My transylvanian river painting is going through a number of changes. This sometimes happens but not usually as much as this. I think the different lighting effects have been difficult to resolve. 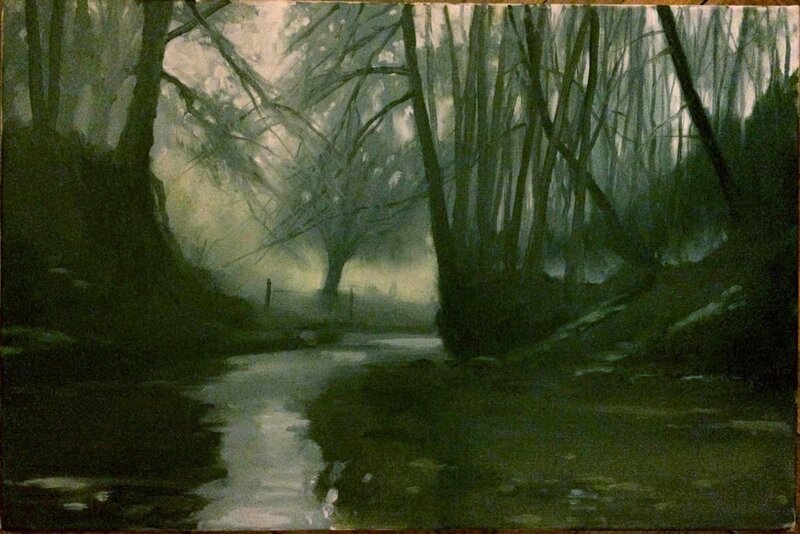 I also post another River Axe painting which is almost complete I think.